Offering quality guitar, bass, and all stringed instrument repair in the Kansas City area. In addition, have made more than 200 "electroCoustic" instruments(guitars, basses and mandolins) over the last several years. 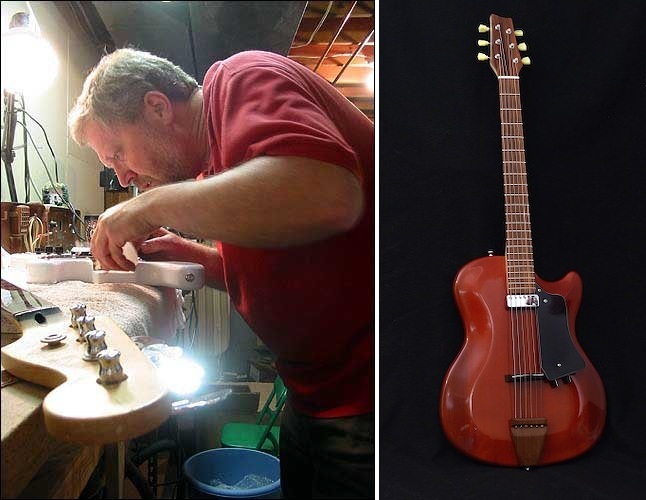 Completely knowledgeable in all aspects of fretted instrument repair, design and manufacture. - Thousands of setups, refrets, pickup swaps, peghead repairs, etc. Adding to the above experience is more than 45 years of professional performance and sound reinforcement management. I thoroughly understand the challenges a professional requires in their instruments. Whether it's the sensitivity of an acoustic instrument in a live sound field, or the difference between solid state and tube driven amplification, most of your questions can be answered in a practical manner. Whether your instrument needs a basic setup, has a broken peghead, you're looking for a pickup swap, or you just want an evaluation of your instrument's condition, I can help answer your questions, and provide sound, economical solutions. We are conveniently located on the south side of Kansas City, just a couple of minutes from I-435 near Avila College. Please call with any questions you may have, or to set up an appointment. Simple repairs can usually be accomplished in a day or so. ALSO, please take a look and listen to my "Wendler electroCoustic" series of acoustic electric guitars, basses, and mandolins.